Don't like green? Don't worry - it's about to go away. 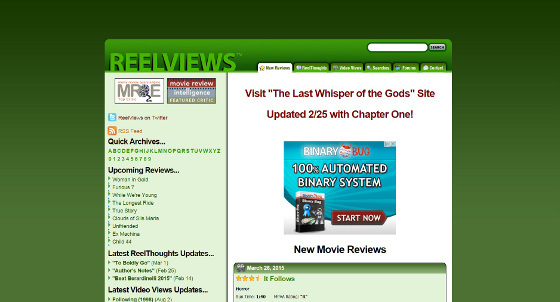 One of the biggest complaints I received when I debuted the June 1, 2008 iteration of ReelViews is that the green is overpowering. It's hard to believe that was seven years ago. 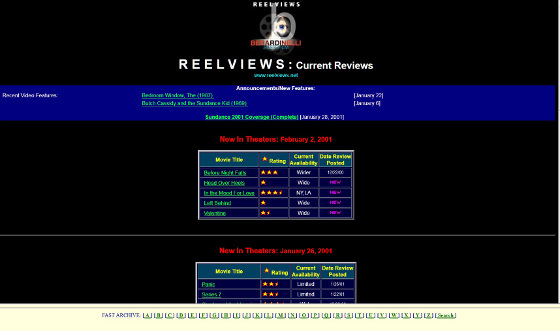 Until that point, ReelViews had existed as an html-exclusive website; Version 2.0 (and later 2.1) was an attempt to modernize it. It was successful to a point, but the style and approach have become increasingly dated over the years. What was intended in 2008 to be elegant and up-to-date has become clunky and unintentionally retro. "Fixing" ReelViews this time around wasn't an option. It needed to be rebuilt from the ground up. For the 2008 upgrade, I needed help. It wasn't like 1996, when I created the original site on my own. My understanding of databases, php, and CSS were limited - enough to do simple things but not necessarily sufficient to build the kind of website I wanted. So ReelViews 2008 was a combination of my efforts and those of a small group of dedicated readers who offered their time and skills gratis. I am grateful for their contributions. But time moves on and my meager web building skills are no longer sufficient, even with help. I started looking for candidates to handle the ReelViews upgrade late last year. In January, I received several proposals - all of which were impressive. After agonizing over how to proceed, I selected Vlinde (a startup in Germany) to do the work, in part because Managing Director Guntram Göres was familiar with the site. Work began in earnest in February 2015 with the basic site ready for "alpha" testing a week ago. "Beta" testing will begin in the next few days. The site should debut in mid-April. Check my Twitter feed (@ReelViews) for details. So what will the new version of ReelViews offer? In terms of content, everything available in the current iteration will be moved to the new one. The four main sections will continue: Movie Reviews, ReelThoughts, Video Views, and Fictional Writings. The basic philosophy of how to organize the site remains the same - make it easy to access not only the newest reviews/ReelThoughts/etc. but older material as well. Get where you want with as few clicks as possible. From my perspective, it's now easier to get things onto the site; this will result in more "early" review postings (to the degree that reviews are not embargoed by the studios) and hopefully more regular ReelThoughts postings. I also intend to expand VideoViews. Those who follow me on Twitter have read of my intention to re-review all six Star Wars films later this year (one per month, June through November). These will be fresh reviews with possibly new star ratings. They will not replace the original reviews (which will continue to be available) but instead will reflect how I feel about the movies in 2015 as the saga enters its third era. In 2016, I will do something similar for the Star Trek movies to mark that franchise's 50th anniversary. All of those reviews will fall under the "Video Views" umbrella. That is, after all, where the films are available. The forums aren't going away, although I have pared them down to a manageable size. Going forward, however, when it comes to commenting on individual reviews/ReelThoughts, each page will have embedded comments. Posting comments requires that you have a (free) ReelViews account and be logged in. (This is a different account from one current forum participants may have.) The account can be obtained automatically. If all you want to do is read the comments and not participate, no account is needed. It all depends on the level of involvement you want. This feature is perhaps the biggest change to ReelViews in that it now invites reader reaction and participation. For a while, I considered pursuing iOS and Android apps for ReelViews but, in the end, the benefits didn't justify the price. The site is being optimized so it's usable (both for reading and commenting) on phones and tablets. I won't rule out going the app route in the future but I'd like to see where things are in another year or two on that front. The site also has a section devoted to my fictional writing. At this point, that means "The Last Whisper of the Gods" and its related short stories. The plan for these hasn't changed - short stories will continue to be posted through mid-summer, along with two more sample chapters. When the book is available, there will be a direct-purchase link for it, regardless of whether it's print-and-electronic, or electronic only. This section is now an organic part of the site rather than an unwieldy add-on. Information about the publication date will be announced across the website and on Twitter and new (professional) artwork will accompany publication. As far as other changes are concerned, when the new site debuts, you can discover them by browsing… As always, please give consideration to those who advertise on ReelViews since the revenue from that advertising keeps the site afloat. Want to be a beta tester? I'm not looking for a large beta test group and I already have a few members, but I'd like to open the field a little to anyone with a strong interest in participating. The responsibilities of a beta tester are simple: browse the site and find things that don't work - either because you don't like the way something was implemented or because there's a bug. I'll convey all concerns to Vlinde and changes will be performed. I have two requests for beta testers - that they have a real desire to do this and invest at least 2-3 hours surfing the site during the 10-day beta test period. If you're really interested, not just casually interested, drop me an e-mail. Don't feel rejected if I don't accept you. The pool is small and it's possible that it might be full by the time I get your e-mail.